and fruit connoisseur destination, with people who love tropical fruit flowing through at a steady clip to sample some of Thailand's best produce. But is it really worth the trip to Chanthaburi, a spot that's a bit off Thailand's beaten tourist path, just for a fruit feast? Let me tell about my experience there. The Durian Festival: What Is It? Like many ambiguously-translated Thai phrases, there are several names for the festival. Signs in the city and online documents varyingly call it The Chanthaburi Durian Festival, The Chanthaburi Fruit Festival, or the World Durian Festival. The event, whatever you want to call it, takes place in the small city of Chanthaburi in the province of Chanthaburi, a rich agricultural region near Thailand's eastern border with Cambodia. 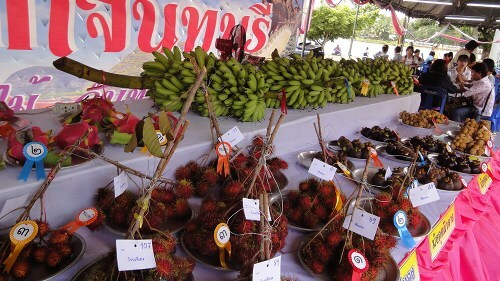 The yearly gathering there celebrates of the vast amount of tropical produce grown in the orchards surrounding Chanthaburi city. The most popular fruit, of course, is the Durian, aka, the king of fruits. Chanthaburi province churns out half of Thailand's durian crop, and more farmers in the area grow various types of durian than any other crop, although other tropical fruits are also prominent. It's no surprise, then, that the city would have a festival honoring its most popular fruit. What I like about the festival is that it actually honors the fruit by featuring it prominently for sale in its natural state, unlike in North America, where, for instance, the strawberry festival in my home town features no fresh strawberries, but only processed and baked strawberry-based products. There are plenty of stalls selling all kinds of tasty fruit, as well as the usual processed foods based off durian, normal cooked Thai food, meat on sticks, toys, clothing, knickknacks, cool hand-carved furniture, and plenty more. 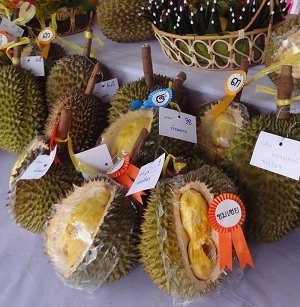 The produce available at the durian festival is certainly of great quality. I devoured melt-in-your-mouth mangoes, enough durians to give me a hangover, and mangosteen that really hit the spot. What Produce Is Available At The Durian Festival? Cherimoya (You have to look around the market a bit for them). But in all honestly, while I'd say the selection and quality of durian may have been slightly better than I've found elsewhere in Thailand, the rest of the fruit was no better. I've been living in the northern Thai city of Chiang Mai, and at Muang Mai Market the prices tend to be as good or better, the selection is broader (they have egg fruit here, for instance), and the quality is pretty much at the same level (watermelons are way better here). And if you're simply looking for the best quality durian, then most of the durian connoisseurs (I don't consider myself one) will tell you that the paragons are all grown in Malaysia's Penang province, and that Thai Durian is at best a runner up. Still, if you're looking for a place to eat good-quality fruit in May, The Durian Festival is a good bet. I'm simply trying to make the point that it doesn't blow away the fruit available in the rest of Southeast Asia. The city itself is not a touristy city, and is primarily set up to service the agricultural and mining industries that are the province's economic engines. Because of this, the selection and quality of hotels isn't going to compare to a place like Chiang Mai, fewer people speak English, and western tourists still seem like something of a novelty to many of the locals, which is kind of refreshing. The city has about 30,000 residents, and is significantly less dense than Bangkok, or even Chiang Mai. It's not a particularly attractive city, with the one city park, King Taksin the Great Park, being the notable exception. The park is centered on a large island surrounded by a man-made lake, with beautiful trees and shrubberies all around. I spent many great evenings here during the festival, polishing off the days with delicious fruits meals and the company of interesting people. All around the perimeter of King Taksin The Great Park and through the municipal center of the city, the Durian Festival sprawls. There are countless stalls selling food, clothing, toys, and just about everything else you'd expect at a festival. You can engage in a durian speed eating contest (I took second, losing by a mere 10 grams! ), there are amusement park rides for children, and every night musical acts and other entertainment groups put on shows at the central stage. For me, the fruit itself wouldn't have been enough of a draw. However, because there are so many health-conscious, progressive raw foodists in attendance, it's a nice chance to socialize with other like-minded people. My friend, Grant Campbell, organized a raw food retreat coinciding with the festival in 2011, and plans to hold them yearly. You can find out about his future retreat plans here. Grant was nice enough to let me participate in many of his retreat's activities, and I had a great time getting to know his group as well as the other fruit tourists moving through the area. We took several trips outside Chanthaburi city, visiting a waterfall, one of the best beaches I've seen in Thailand, which was called Ao Krathing, an organic farm, and a Buddhist monastery. There are also several national parks around the area. The dates of the 10-day durian festival differ from year to year based on when the durian crop will be harvested. Generally it starts in late April or early May. In 2011, the dates were May 5 to 15. This Thai website generally has the dates a few weeks before the festival starts. Every day the first fruit stalls start opening around 9 or 10 a.m., but most of the festival activities gear up around noon. The festival is busiest at night, with activities continuing through 10 p.m. There are no train lines running to Chanthaburi, but several bus lines make regular trips. If you're traveling from Bangkok, find transportation to the Bangkok Eastern Bus Terminal (Ekamai) on Sukhumwit Road. First class buses to Chanthaburi leave every half hour or so during the day, with tickets around 150 baht. Although there are some really cheap, really basic hotels in the city with employees that don't speak any English, there are a few with fairly modern accommodations and better service. The River Guest House is fairly nice. A basic spartan-but-clean fan room with a shared bathroom and no windows starts around 150 baht per night, but it was too claustrophobic for me. For around 250 baht you can get a bigger room with windows, a fan, and a built-in bathroom. The more expensive rooms have air conditioning. The next tier up, for around 600 baht a night, can be found at the Gem's Club. More expensive resort-like accommodations can be found outside the city. Learn how to eat a healthy fruit-based raw food diet. Liked reading about the durian festival? 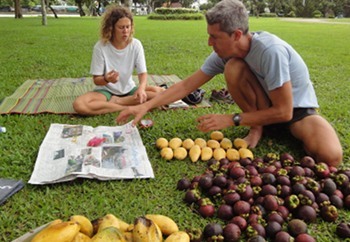 Learn about other fruit-filled locations. Got durian hangover? Get some awesome low-fat salads inside you and you'll feel a lot better.